"The sign of the cross, represented in its simplest form by a crossing of two lines at right angles, greatly antedates in both the East and West to the introduction of Christianity. It goes back to a very remote period of human civilization". "the Gospels could not be either more or less in number than they are, as there are the four zones of the world via which we all live". Several early Christian compositions unearthed in Egypt additionally defined the Egyptian Ankh Cross, which also included works from Sextus the Pythagorean, parts of Plato's Republic on the Just-Man crucified, and extracts from the zodiacal Hermetica. In the Greco-Roman world, from where Christianity later flourished, the most dominant cult (1000 BC) of a savior nailed upon a crucifix was that also of the pagan fertility god Osiris-Dionysus (left), who suffered persecution, died, and then rose again from the dead. Only was it until the late 5th century that genuine portrayals of Jesus on a crucifix were found, as before this time however, artifacts had all but depicted Jesus as the fish, or as the shepherd, but never on a Cross. 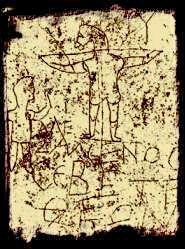 This graffiti (right) sketched out a man with a donkey's head crucified upon a cross with the caption "Alexmenos worships his god". "You it is, ye Pagans, who are the most likely to adore crosses. Your winning trophies not only represent simple crosses, but a cross with a man on it". "It is certain, that, however much the male element had proclaimed itself ... by the days of the Minoan civilization (3000–1100 BC), the religion still continued to manifest the matriarchal period of social progress. Clearly the Goddess was supreme.."
"Other religions celebrated the cycles of birth and death; Christianity insists in the one unique historical moment where this cycle is reversed, and that a dead man literally came back to life". Despite this vampire transformation act, her eminence inside creationism was often foremost with her figure solemnly being accredited exclusively as providing new birth always to objects that had seemed dead. Analogous words like 'womb', 'tomb', 'resurrection', 'regeneration', 'renewal, 'procreation', 'origination', 'genesis', 'birth', 'rebirth', 'conception' and so forth all still have their deepest origins with her fertility cults. "our current organized system is reproduced from Mother Nature, with the observation of these great astronomical regulations giving man not only the model for the introduction of order into his own life, but the very first clues about how to do it." To historians like Tacitus, the clans of Europe (goddess Europa) even deemed her the deity to whom all else was subject and duteous. In Athens, the Virgin Mother goddess Athena, like Jesus, also raised a jury of twelve over which she presided. Notable philosophers ("Lover of Sophia") such as Socrates even became conversant on a Pythagorean (python/serpent) priestess who taught him the decree of affinity as according to Plato. In ancient India, she was held as the Mother of the Brahmana, Aditi, who likewise gave birth to Adityas, the twelve Suns/Sons annually, subsequently becoming one Sun god fused upon twelve disciples. Early provisional migrations of the Hindu god Brahma (A-braham) and the goddess Saraswati (Sarah / A-sherah) had also long been established via trade routes to the east of Mesopotamia adjacent to the Tigris-Euphrates that spread to the Nile. Some of the most oldest specimens of archaic writing (3300 BC) likewise emerged from Uruk and the Temple of Inanna (Babylonian Ishtar, Phoenician Asherah) the Queen of Heaven, of which was one of the most oldest cities in southern Mesopotamia, where Abraham (1900 BC) was later born. "But also that the temple of the great goddess Diana (Inanna) should be hated, and her magnificence should be destroyed, whom all Asia and the world worshippeth." "Break down their altars, smash their sacred stones and cut down their Asherah"
Her initial Stellar worship as the Serpent Goddess (click image right) became instituted in many early Hindu, Sumer-Babylonian, Aegean, Cretan and Egyptian practices, which predominated the votary, pottery, sanctuary, customary and figural characteristics of each culture. To many, like the Egyptians, the hieroglyph for "Goddess" simply became delegated as the Uraeus (Serpent), which was worn as a headdress by all Egyptian pharaohs as a symbol of sovereignty, dating back into pre-dynastic times. Her association as the Queen of Heaven, and the Serpent, including the ideal of evil, or darkness also had a long astronomical foundation attached to it, warranted down through the hostilities between the Stellar and Solar priesthoods on account of the Great Dragon/Serpent, or the constellation Draco, that once ruled the celestial sphere with its body spreading over seven signs of the zodiac. "And you shall destroy all the places where the nations whom you shall dispossess served their deities, upon the high mountains and upon the hills and under every green tree you shall tear down their pillars and burn their Asherah with fire." In ancient Phoenicia, she was summed up as the chief deity Ba'alat Asherah, whose Stellar cult presided over Acre, Sidon, Tyre and Byblos as far back as the 4th millenium BC, well preceding the time of Moses. The Sidonian Kings went as far as even entitling themselves the high priest of Asherah, while the hieratic priests via the once settled Egyptian colony of Byblos enlarged the proto syllabic Linear alphabet, as was the Serpentine cultivation abound with Linear A and B to Crete and Greece. "I am Yehawmilk, King of Byblos, whom the Mistress, the Lady of Byblos, made King over Byblos... May the Lady of Byblos bless and preserve Yehawmilk, King of Byblos, and prolong his days and years in Byblos, for he is a righteous King." Resting on the walls of her sanctum, intercessions were carved beseeching her as the Serpent Lady. These archaeological excavations by Sir William Flinders Petrie in the Sinai Desert furthermore referred to the consort of Ba'al as Ba'alat ("Lady of Byblos") of which her Golden Calf was worshipped by Aaron and the early Hebrews before the annexation of the marauding Levites (Exodus 32:3-4). Her emblem later being appropriated under the Cornucopia, or the Horn of Plenty, delineated as the Cow's horn pouring forth all the fruits and flowers of the earth. 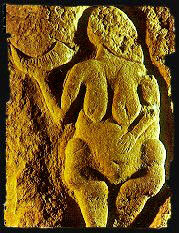 (Left) Ice Age stone carving of the Venus of Laussel in central France (dated 21,000-18,000 BC). Just one of the many clear messages enduring the ages that confirm human celestial mathematical knowledge of the nexus between the Moon's egg shaped orbit, and the 28/29.5 day gestation reproductive cycle. The term "Friday" of "Good Friday", like the unlucky "Friday the 13th" additionally became consolidated via the archaic goddess Freya/Venus/Astarte and is familiar mostly today as the demonic Christian Satanic symbol, or the five pointed rosary star of the "Pentagram" of Venus/Astarte, integral with the anniversary of the crucifixion of Jesus. The pentacle also being long attested by Mesolithic astronomers which equally depicts the same rosary geometrical pattern drawn by Venus every eight years around the Sun in our night sky. The ancient Romans referred to the Stellar cults of Venus as "Lucifer" the light bringer, or the morning star that announced the daily birth and death of the divine Sun from Dawn/Aurora, the morning goddess of the Sun. In Phoenicia, Venus was known as "Shaher", and the evening star "Shalem", born from Asherah in her womb aspect as Helel "the Pit". "Aster, once as Morning Star, light on the living you shed. Now, dying, as Evening Star, you shine among the Dead." Our customary idiom for "Hell" also stemmed via this, though by means only through the demonization succeeding the 7th century of the Teutonic goddess "Hel" in Scandinavia. "Let's assume for a minute that he foretold his resurrection. Are you ignorant of the multitudes who have invented similar tales to lead simple minded hearers astray? It is said that Zamolxis, Pythagoras' servant, convinced the Scythians that he had risen from the dead... and what about Pythagoras himself in Italy! -or Rhampssinitus in Egypt. The last of these, by the way, is said to have played dice with Demeter in Hades and to have received a golden napkin as a present from her. Now then, who else: What about Orpheus among the Odrysians, Protesiaus in Thessaly and above all Heracles and Theseus." The secrets of early Mysteries were considered so well kept that our knowledge of them is still incomplete, due to them never being committed down to writing. Plato deemed that its tradition, including the euphonies of Isis were over 10,000 years old. The most famous Mysteries though outside of Egypt, was associated with Dionysian, Bacchanal, Orphist and Samothracian Mysteries, together with the Eleusisian Mysteries practiced near Athens which were based on the worship of the goddess of fertility Demeter as transliterated through various other names. In Rome, it was attributed to the goddess Ceres and the Mysteries were also practiced by men via Mithraism, which included a symbolic washing in the blood of the sacrificial Bull. The principal sacrament of Mithra, similar to Dionysus, the god of wine was that of the consumption of the flesh and drinking the blood of the sacrificial animal before rebirth. These Mysteries likewise matured afterwards into religious worship inside early Christianity where Christians received the Eucharist in secret rituals including the rites from Dionysus, including the concept of Heaven and Hell, turning water in wine, and eating the flesh of the Son, and drinking his blood prior to his death. To Christians, this was based upon the necessity of a human blood sacrifice, rather then animal, which was to atone for the sins of the world. As Tertullian and early Christian theologians echoed "the seed of the church was built upon the blood of the martyrs". Afterwards, when Christianity became the official religion of the Roman Empire, these sacraments then became much more mainstream and public. Individuals such as Celsus the Platonist criticized the Christian piety in the 2nd century for impiously gossiping about god while trying to arouse the awe of the illiterate, and thus pretending to behave like guardians of the Bacchic (Dionysus) Mysteries. "it is said that they were all initiated into the Mysteries of the Great Mother, because they found that the whole mystery of rebirth was taught in these rites". To the Roman historians Suetonius and Tacitus, Christianity was seen as nothing but a new depraved and deadly superstition. "fabulous and formless darkness mastering the loveliness of the world." In the Greco-Syriac myth, the cult was held by women who worshiped the beautiful fertility god Adonis. Yearly carnivals called "Adonia" took place at Byblos and abroad to commemorate his demise and resurrection. Or in other words, Jesus Christ and all the others upon whom this character is predicated are personifications of the Sun, and the Gospel fable is merely a rehash of a mythological formula revolving around the movements of the Sun through the heavens. For instance, many of the world's crucified godmen have their traditional birthday on December 25th ("Christmas"). This is because the ancients recognized that from an earthcentric perspective the Sun makes an annual descent southward until December 21st or 22nd, the winter solstice, when it stops moving southerly for three days and then starts to move northward again. During this time, the ancients declared that "God's Sun" had "died" for three days and was "born again" on December 25th. The following are the characteristics of the "Sun of God"
The Sun at 12:00 noon is in the house or temple of the "Most High"; thus, "he" begins "his Father's work" at "age" 12. The Egyptian Pharaohs also identified themselves in life with the Sun god Horus and in death with his father Osiris. These myths identified the Pharaoh as both the earthly form of the royal falcon god who triumphed over his enemies and the pious son who claims the throne after the death of his father. Whilst Osiris ruled the dead in the underworld, Horus ruled the living. Horus and Osiris, just like Jesus, became interchangeable in the mythos ("I and my Father are one"). Horus, who predates the Christ by 3000 years shared the following in common with him. He was also the "Way, the Truth, the Light," "Messiah," "God’s Anointed Son," the "Son of Man," the "Good Shepherd," the "Lamb of God," the "Word made flesh," the "Word of Truth," etc. Contrary to popular belief, the ancients were not an ignorant and superstitious lot who actually believed their deities to be literal characters. Indeed, this slanderous propaganda has been part of the conspiracy to make the ancients appear as if they were truly the dark and dumb rabble that was in need of the "light of Jesus." The reality is that the ancients were no less advanced in their morals and spiritual practices, and in many cases were far more advanced, than the Christians in their own supposed morality and ideology, which, in its very attempt at historicity, is in actuality a degradation of the ancient Mythos. Indeed, unlike the "superior" Christians, the true intelligentsia amongst the ancients were well aware that their gods were astronomical and atmospheric in nature. Socrates, Plato and Aristotle surely knew that Zeus, the sky god father figure who migrated to Greece from India and/or Egypt, was never a real person, despite the fact that the Greeks have designated on Crete both a birth cave and a death cave of Zeus. "In 1968, research by A. M. Molchanov revealed the entire solar system was a tuned quantum resonant structure, with Jupiter being its main conductor." The Greek historian Herodotus associated both the Greek god Zeus, and the Roman god Jupiter Amon, with the Egyptian god Osiris. Amon in Egyptian mythology being the human-Ram headed god most often represented with the ceremonial beard, as iconic to Jupiter's kingship into Aries the Ram. The Fish of Pisces represented by the 12th sign of the Zodiac, encapsulated with two crescent moons, one waxing, one waning, is but one of the most oldest symbols used by early Christians to identify themselves with the new king of the gods, as distinguished by the "Fisher of men". "But we, the Christians, are little fishes after the type of our great Fish Jesus Christ, born in the water". Popular hymns later referred to Jesus as "the Little Fish which the Virgin caught in the Fountain". In Greek though, the Fish became known as "Icthys", which too was later nominated as the icon of Jesus in Hebrew afterwards used as an acrostic from the Greek "Iesous Christos Theou Hyios Soter" or "Jesus Christ, of God the Sun/Son, Saviour". This Ichthys, fish of the water, also became known as the offspring Sun of the ancient sea and Moon goddess which had long been a central figure to much early mythologies revolving around the zodiac when Jupiter entered into Aries the Ram through Pisces. This fish symbol virtually attached itself to an array of ancient Moon deities due to this lunary orb governing the sea and tides, as according to Pliny, along for which the enquiry of the Heavens too became a profession held down exclusively by women who promulgated the changes of seasons and the harvest, such as designing calendars, predicting eclipses and forecasting the future. Even at one of the most important and oldest sanctuaries in Greece, "Delphos/Delphi" also meant "Whale" and "Womb", from where the Pythia (Pythoness) Oracle received her prophesies and where the Greeks consulted preceding a major operation. In Babylonia, it was the Solar tale of the fish goddess Derceto/Atargatis with the god Oannes/Joannes, including also Nammu and Tiamat. In the Biblical tale, like Jesus born from Mary, or Maria, from where Marine, or where water comes from became rendered through Oannes/Jonah, who allegorically did the same exploit inside the Womb/Tomb of the world's largest sea Mammal. Yahweh concluded alike in the Old Testament by subjugating the sea Serpent Leviathan ("Whale" in Hebrew). The seditious natural historian Charles Darwin's evolution also emphasized this belief implying that the gestating hydrous womb was likewise interdependent on the lunar tidal rhythms, linking our heritage and origins to the sea. "for, as Jonah was in the belly of the fish three days and three nights, so shall the Son of Man be in the heart of the earth three days and three nights." As accompanied by the fish story of Jesus miraculously helping his disciples land a catch of 153 fish, this same feat is also strangely achieved by Pythagoras five hundred years earlier in an ancient legend recorded by the neoplatonist Porphyry. Pythagoras himself predicting the exact number of fish to be caught, with the 153 being a sacred Pythagorean number associated with the "Vesica Piscis" or "Vessel of the Fish" (image right). Even in Greek, the name for Jesus being Iesous, is very similar to the name of Zeus/Jupiter itself. As Acharya S described Zeus, aka "Zeus Pateras," who we now automatically believe to be a myth and not a historical figure, takes his name from the Indian version, "Dyaus Pitar." Dyaus Pitar in turn is related to the Egyptian "Ptah," and from both Pitar and Ptah comes the word "pater," or "father." "Zeus" equals "Dyaus," which became "Deos," "Deus" and "Dios", "God." "Zeus Pateras," like Dyaus Pitar, means, "God the Father," a very ancient concept that in no way originated with "Jesus" and Christianity. In Hinduism (one of the oldest living religions) Krishna/Christna was also called "Khrist-os" centuries before any Jewish character was similarly named. "The idea of a complete and clear-cut canon of the New Testament existing from the beginning, that is from Apostolic times, has no foundation in history. The Canon of the New Testament, like that of the Old, is the result of a development, of a process at once stimulated by disputes with doubters, both within and without the Church, and retarded by certain obscurities and natural hesitations, and which did not reach its final term until the dogmatic definition of the Tridentine Council." The major winter festival that the ancient however did celebrate, particularly Aryans was that when the Sun reached the point farthest south of the equator beginning Dec 21st, and ending Dec 25th. This was seen as the renewing of the Sun every year and appeared at its most southerly position, directly overhead at the Tropic of Capricorn (23 degrees 27 minutes south latitude) in the Northern hemisphere. 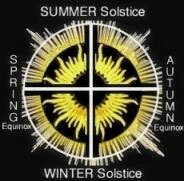 From late winter, up until the spring equinox was the "40 days", which later became Christian Lent. The first written mention of Mitra dates back around 3,500 years in the Hindu Vedas, and then assumingly spread to Persia and reached west throughout the entire length of the Roman border to Scotland. It is still regarded as one of the most universal religions and greatest mystery cults in the Western World. Its mysteries that spread by the Romans likewise had a large significant importance on the development of early Christianity during its first four centuries. 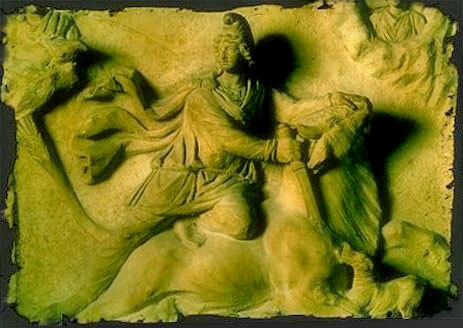 Both Roman Mithraism, like Iranian Mithraism were cults of loyalty toward its king. Many prominent Roman figures were among its initiates, and were encouraged by various Roman emperors, such as Commodus, Aurelian, Diocletian, Galerius and Licinius. In 307, a temple was even dedicated to Mithra and he officially became the "Protector of the Empire". The birthday of Mithra furthermore occurred during the Winter Solstice that celebrated the Natalis Solis Invicti on December 25th. This large celebration was known for signaling the birth of a young Sun god who sprang from a rock or a cave in the form of a newborn infant. In 313 CE, the official birthday of Jesus in alignment with Mithra also became December 25th. In the year 375 CE, Pope Julius I likewise declared the Nativity of the birth of Jesus as December 25th to align followers of the Sun god Mithra. This event became the very motivation as to why Jesus received his official birth anniversary on December 25th in accordance of the ancient pagan resurrecting solar godman in the Roman Empire, as before that, no one knew of his historical birth. St. Augustine even went as far as declaring that the priests of Mithra worshipped the same deity as he did. Paul equally attested to knowing nothing about Jesus' birth, ministry and healings, which was alarming, as the origins of Christianity itself derive from Paul, and not Jesus. Paul doesn't even quote anything that Jesus is alleged to have said, nor did any of Jesus' original twelve disciples write of his teaching. Afterwards, St. Augustine wrote that Christians ought not to celebrate Jesus' birth, like the heathens do on account of the Sun, but rather on account of god who made the Sun. 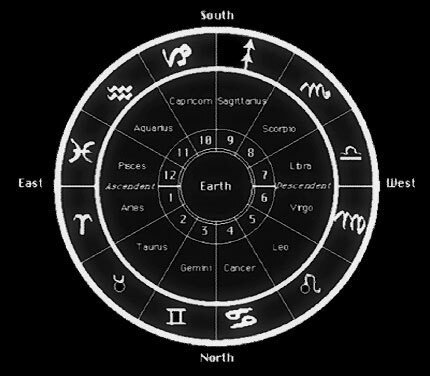 The early Jesus was regarded so much a Sun god himself to the ancients, that the term Jesus of Nazareth (Nazaroth) in Hebrew is actually the twelve signs of the zodiac. No city by this name existed during this time. A church council further declared that it would be wrong to celebrate the birthday of Jesus as though he were a King Pharaoh. Eventually though, this festival of "Christmas" became a civic holiday by the emperor Justinian where the events became so customary that it begun marking the beginning of the ceremonial year for Christians. The use of giving gifts, holly, mistletoe, yule logs, fruitcake, ringing bells, candles, wassail bowls, and decorating a tree however all derived from early pagan customs. Many European countries still call this celebration "Yuletide" (or wheel of the Sun) A harvesting festival celebrated at the end of the year. None of which derive from Christian origins. In spite of Mithraism being regarded as a late ascetical all male cult, with a priesthood consisting of celibate man and militants only, a much earlier feminal Mithra had been identified with the Persian goddess Anahita. 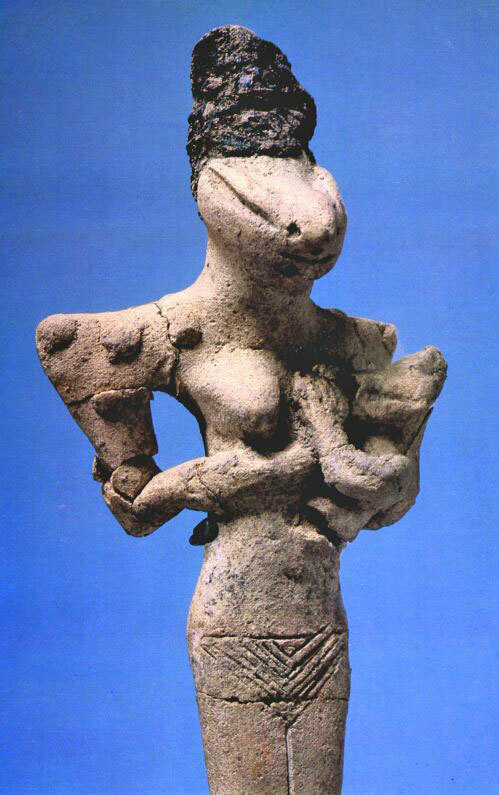 According to the Greek historian Herodotus, the ancient Persians worshipped a sky-goddess Mitra, the same as Mylitta, Assyria's Great Mother, and Alitta, known to the Arabians. The Lydians then went about combining Mithra with his archaic Mother/spouse Anahita as an androgynous Mithra-Anahita, as distinguished with Sabazius-Anaitis of the Anatolian mystery cults. The correlation of the Bull and the Goddess, including the Bull's blood being delivered to the Moon for fructification can also be explained through the coexistence of its procreant objective. When the Bull's head is viewed from a forefront perceptive its cranium and horns exhibit a striking match of the uterine organs of the human female. "The devil, whose business is to pervert the truth, mimics the exact circumstances of the Divine Sacraments. He baptizes his believers and promises forgiveness of sins from the Sacred Fount, and thereby initiates them into the religion of Mithras. Thus he celebrates the oblation of bread, and brings in the symbol of the resurrection. Let us therefore acknowledge the craftiness of the devil, who copies certain things of those that be Divine." It was a known fact that Mithraism had included these rituals a long time before the time of Jesus Christ. In 1989, Mithraic scholar David Ulansey wrote the book "The Origins of the Mithraic Mysteries", in which he exhibited its local Anatolian descent in Tarsus, Turkey, the home of the apostle Paul, and dating well back to the representation of the astronomical situation from the Age of Taurus the Cow/Bull (4500-2400 BCE). Many Scholars now agree that Paul, the founder of Christianity, likewise subsisted as the Pythagorean philosopher "Apollonius of Tyana" (after the Sun god Apollo) who was the former Solar Messiah to the figure of Jesus Christ. Many Roman writers reference Apollonius as "Pol" and various comparisons have been made between them, such as being located at Tarsus, Ephesus and Rome at exactly the same time of each other. Pol also had a companion called Demas, as Paul does with Damis. "For when one says, 'I belong to Paul,' and another, 'I belong to Apollos,' are you not merely human? What then is Apollos? What is Paul? Servants through whom you came to believe, as the Lord assigned to each. I planted, Apollos watered, but God gave the growth." The catacombs extended six miles deep underground, and are also considered the single most precious collection of early Pagan and Christian art in the entire world. Believe it or not, Rome has some 600 miles of catacombs altogether, and today can even be found pictures of the baby Horus being held by the Virgin Isis-Meri (Mary) in what scholars have claimed is the original "Madonna and Child". 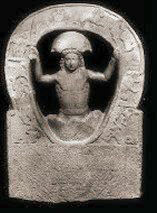 Hundreds of temples, sculptures, fragments and inscriptions dedicated to Mithras have likewise been found. 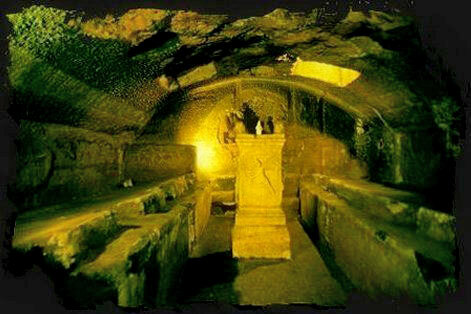 The Mithraic cave temple on Vatican Hill that was seized and destroyed by literalist Christians in 376 CE, also lies directly underneath the Vatican. Christian bishops of Rome additionally preempted the Mithraic high priest's title off Pater Patrum ("father" Egyptian for "Ptah") who was known as the "Papa." (the Pope) The first Pope of the Catholic Church was Simon (a Gnostic), who was then later ironically enough renamed Peter (or Saint Peter) by the Roman Church. "Roman sources that mention Jesus are all dependent on Christian reports. Jesus' trial did not make headlines in Rome, and the archives there had no record of it. If archives were kept in Jerusalem, they were destroyed when revolt broke out in 66 CE or during the subsequent war. That war also devastated Galilee. Whatever records there may have been did not survive. When he was executed, Jesus was no more important to the outside world than the two brigands or insurgents executed along with him, whose name we also do not know." The word "Easter" stems from the Anglo-Saxon goddess of fertility "Eastra", or Oestre. In Latin, Ishtar or Astarte. In the Old Testament, Astarte the Phoenician goddess of fertility was called "Ashtoreth the goddess of the Sidonians" and Ashtaroth, for which a great Spring festival was held in her honor. According to the English theologian and historian Bede in the 8th century, early Germanic Christians acquired her name and ceremonies based on the resurrection of the Sun's ascendance in the "East" at the Vernal Equinox, when day and night were in equal length. The Anglo-Saxons additionally called "April" Oster Monat (Moon), or the conceptive phase of advancing into a new generative season. After much debate about Easter, the later official liturgical Christian Easter also fell precisely on the same Sunday (Sun's Day) after the first full Moon of the equinox ("equal night") following March 21st, the same period as various ancient resurrecting fertility gods. March 21st to April 19th on the Zodiac being Aries the Ram, or Alpha Arietis being the brightest star in the constellation Aries. It is known as Hamal, an Arabic name meaning "Sheep". 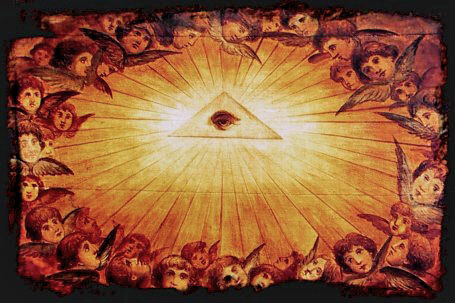 In Egypt, this was known as the popular cult of Aries, or the Sun god Amon "RA"/"RAM", the Lamb of god. Even still as an expression of faith today, Christians say "Amen", which is symbolized by the Ram (Lamb) and is a very important Easter symbol relating not only that to the Sun's death and rebirth, but also to the Lamb sacrificed during the Sun's Passover on the Zodiac. Correspondingly, the fertility goddess Astarte/Oestre's symbols are those representing rebirth (eggs) and her earthly Easter symbol is that of the prolific March hare, which would lay eggs for good children to eat for Easter celebrations. This custom of exchanging eggs began when the ancients dyed them in Spring colors and gave them to their friends as gifts. They believed that the world egg was actually laid by the Moon goddess and was split open by the heat of a Sun god, hatching the world. Never though will people find anything about the "Easter bunny", or "Easter eggs", or the actual festival of Easter itself mentioned anywhere in the Bible. It wasn't until the year 190 CE that Pope Victor I made Easter Sunday the official day of celebration for Christians in Rome. Afterwards it went through many metamorphic stages of change as Christians adopted it, and began exclusively calling the festival their own. 335 Constantine sacks many pagan temples of Minor Asia and Palestine and orders the execution by crucifixion of "all magicians and soothsayers." Martyrdom of the neoplatonist philosopher Sopatrus. 341 Flavius Julius Constantius persecutes "all the soothsayers and the Hellenists." Many gentile Hellenes are either imprisoned or executed. 346 New large scale persecutions against non-Christian peoples in Constantinople. Banishment of the famous orator Libanius accused as a "magician". 353 An edict of Constantius orders the death penalty for all kind of worship through sacrifices and "idols". 354 A new edict of Constantius orders the destruction of the pagan temples and the execution of all "idolaters". First burning of libraries in various cities of the empire. The first lime factories are being organised next to the closed pagan temples. A major part of the holy architecture of the pagans turns to lime. 364 An Imperial edict (11th September) orders the death penalty for all those that worship their ancestral gods or practice divination ("sileat omnibus perpetuo divinandi curiositas"). Three different edicts (4th February, 9th September, 23rd December) order the confiscation of all properties of the pagan temples and the death penalty for participation in pagan rituals, even private ones. 373 New prohibition of all divination methods. The term "pagan" (pagani, villagers, equivalent to the modern insult, "peasants") is introduced by the Christians to demean non-believers. The non-Christians are called "loathsome, heretics, stupid and blind". In another edict, Theodosius calls "insane" those that do not believe to the Christian God and outlaws all disagreements with the Church dogmas. Ambrosius, bishop of Milan, starts destroying all the pagan temples of his area. The Christian priests lead the hungry mob against the temple of goddess Demeter in Eleusis and try to lynch the hierophants Nestorius and Priskus. The 95 years old hierophant Nestorius ends the Eleusinian Mysteries and announces the predominance of mental darkness over the human race. 382 "Hellelujah" ("Glory to Yahweh") is imposed in the Christian mass. 385 to 388 Maternus Cynegius, encouraged by his fanatic wife, and bishop "Saint" Marcellus with his gangs scour the countryside and sack and destroy hundreds of Hellenic temples, shrines and altars. Among others they destroy the temple of Edessa, the Cabeireion of Imbros, the temple of Zeus in Apamea, the temple of Apollo in Dydima and all the temples of Palmyra. Thousands of innocent pagans from all sides of the empire suffer martyrdom in the notorious death camps of Skythopolis. 388 Public talks on religious subjects are outlawed by Theodosius. The old orator Libanius sends his famous epistle "Pro Templis" to Theodosius with the hope that the few remaining Hellenic temples will be respected and spared. 392 On 8th November, Theodosius outlaws all the non-Christian rituals and names them "superstitions of the gentiles" (gentilicia superstitio). New full scale persecutions against pagans. The Mysteries of Samothrace are ended and the priests slaughtered. In Cyprus the local bishop "Saint" Epiphanius and "Saint" Tychon destroy almost all the temples of the island and exterminate thousands of non-Christians. The local Mysteries of goddess Aphrodite are ended. Theodosius's edict declares: "the ones that won't obey pater Epiphanius have no right to keep living in that island". The pagans revolt against the emperor and the Church in Petra, Aeropolis, Rafia, Gaza, Baalbek and other cities of the Middle East. 393 The Pythian Games, the Aktia Games and the Olympic Games are outlawed as part of the Hellenic "idolatry". The Christians sack the temples of Olympia. 397 "Demolish them!". Flavius Arcadius orders all the still standing pagan temples to be demolished. 401 The Christian mob of Carthage lynches non-Christians and destroys temples and "idols". In Gaza too, the local bishop "Saint" Porphyrius sends his followers to lynch pagans and to demolish the remaining 9 still active temples of the city. The 15th Council of Chalkedon orders all the Christians that still keep good relations with their gentile relatives to be excommunicated (even after their death). 405 John Chrysostom sends hordes of gray dressed monks armed with clubs and iron bars to destroy the "idols" in all the cities of Palestine. 406 John Chrysostom collects funds from rich Christian women to financially support the demolition of the Hellenic temples. In Ephessus he orders the destruction of the famous temple of goddess Artemis. In Salamis, Cyprus, "Saints" Epiphanius and Eutychius continue the persecutions of the pagans and the total destruction of their temples and sanctuaries. 408 The emperor of the Western Empire, Honorius, and the emperor of the Eastern Empire, Arcadius, order together all the sculptures of the pagan temples to be either destroyed or to be taken away. Private ownership of pagan sculpture is also outlawed. The local bishops lead new heavy persecutions against the pagans and new book burning. The judges that have pity for the pagans are also persecuted. "Saint" Augustine massacres hundreds of protesting pagans in Calama, Algeria. 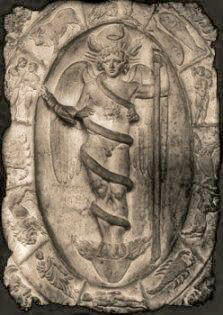 416 The inquisitor Hypatius, alias "The Sword of God", exterminates the last pagans of Bithynia. In Constantinople (7th December) all non-Christian army officers, public employees and judges are dismissed. 423 Emperor Theodosius II declares (8th June) that the religion of the pagans is nothing more than "demon worship" and orders all those who persist in practicing it to be punished by imprisonment and torture. 435 On 14th November, a new edict by Theodosius II orders the death penalty for all "heretics" and pagans of the empire. Only Judaism is considered a legal non-Christian religion. 438 Theodosius II issues an new edict (31st January) against the pagans, incriminating their "idolatry" as the reason of a recent plague! 451 New edict by Theodosius II (4th November) emphasises that "idolatry" is punished by death. 486 More "underground" pagan priests are discovered, arrested, burlesqued, tortured and executed in Alexandria, Egypt. 528 Emperor Jutprada (Justinianus) outlaws the "alternative" Olympian Games of Antioch. He also orders the execution—by fire, crucifixion, tearing to pieces by wild beasts or cutting to pieces by iron nails—of all who practice "sorcery, divination, magic or idolatry" and prohibits all teachings by the pagans ("the ones suffering from the blasphemous insanity of the Hellenes"). 590 In all the Eastern Empire the Christian accusers "discover" pagan conspiracies. New storm of torture and executions. 692 The "Penthekto" Council of Constantinople prohibits the remains of Calends, Brumalia, Anthesteria, and other pagan/Dionysian celebrations. 850 to 860 Violent conversion of the last gentile Hellenes of Laconia by the Armenian "Saint" Nikon.